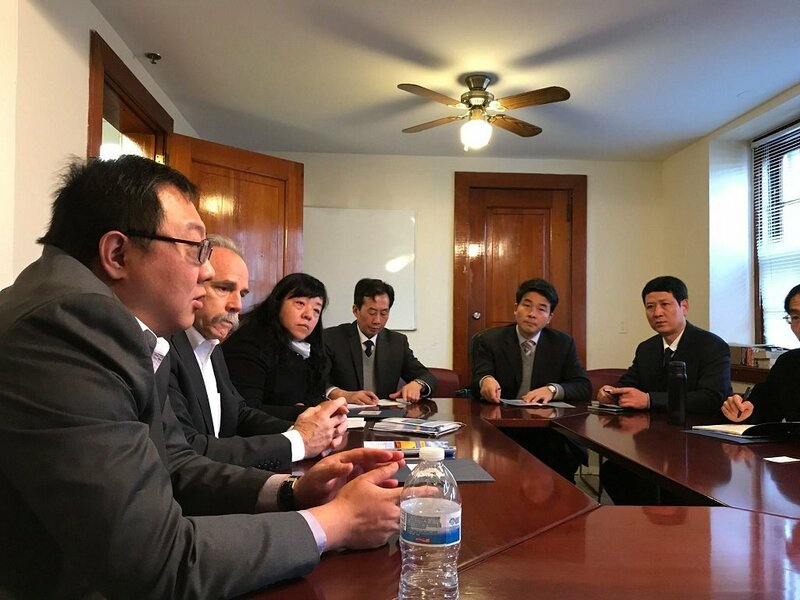 SOMERVILLE, NJ- On December 6th, 2017 Baker and Rannells Attorneys hosted a contingent of government officials from Jiangsu Province, China on their fact-finding-mission to the United States regarding drug policy and treatment programs. Baker and Rannells provided a power point overview of Drug law, Drug Court programs, and various treatment, rehabilitation, and recovery modalities that are used in the U.S. The Presentation was followed by a visit to Freedom House Treatment Center located in Clinton, NJ. Baker and Rannells selected Freedom House because of its significant program success. Freedom House is a non-profit organization that provides a full spectrum of addiction services to adult men and women suffering from substance use and co-occurring disorders. Their motto is “Saving Lives and Reuniting Families”. They are recognized as an international model having a treatment center in Denmark that follows their program structure. Both parties at the meeting discussed the differences in culture and substance of choice between countries. As heroin is a rising epidemic in the United States, so crack cocaine and methoxamine is the leading epidemic in China. Gao Rujun, Director General for Drug Administration – Jiangsu Province, presented Freedom House with a gift as a token of appreciation, explaining that these are the gifts presented to Kings. Baker and Rannells acted as liaison for the meeting and local host during their stay. Baker and Rannells, P.A. was represented by Senior Partner, Jack Rannells, and Senior Associate, Pei-Lun Chang, who also acted as the meetings’ translator. Baker and Rannells, P.A. is a well-recognized authority in Trademark, Copyright, and Patent and related Intellectual Property matters, including Licensing, Domain Name Disputes, and Music and Entertainment law. Whether you are looking to protect your work or resolve an infringement, we have the experienced Intellectual Property Attorneys you need. For more information please check out our website at https://www.tmlawworldwide.com/ or Call (908) 722-5640.